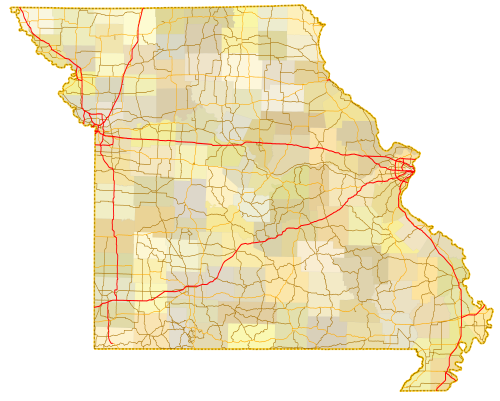 Sitemap to all pages covering the state of Missouri. Contributions and photography for the Missouri guides from Alex Nitzman, Andy Field, Brent Ivy and Justin Cozart. U.S. Census Bureau, 2010 Census Redistricting Data Summary File. St. Louis Rams (NFL) – moved to Los Angeles in January 2016. Kansas City Athletics (MLB), the A’s relocated from Philadelphia to KC in 1955 and left for Oakland in 1967. Kansas City Scouts (NHL), played only two seasons, relocating to Denver as the Colorado Rockies in 1976. Kansas City Kings (NBA), initially the Kansas City Omaha Kings, splitting their games between the two cities until 1979. The Kings moved to Sacramento in 1985. St. Louis Browns (MLB), became the Baltimore Orioles in 1954. St. Louis Cardinals (NFL), moved to St. Louis from Chicago in 1960, vacated Missouri for Phoenix in 1987. St. Louis Hawks (NBA), the Hawks moved to St. Louis from Milwaukee in 1955 and left for Atlanta in 1968.